Stenotic Nares: Is Your Dog at Risk? This dog slight problem, but it does cause her to have loud breathing at times. Stenotic nares is a condition where there is a narrowly restricted nostril which puts a strain on breathing and can lead to an enlargement of the heart. Narrowed nostrils or pinched nostrils are two other terms used to describe the problem. This narrowing causes a limit on the amount of air that can flow into the nostrils and eventually the lungs. Stenotic Nares is a relatively common condition in Shih Tzu dogs and is the result of a group of problems that plague Brachycephalic breeds. The brachycephalic syndrome also includes palate and trachea abnormalities leading to a progressive decline in respiratory function. Any dog that has a flat face with shorter nose such as the Pekingese, Pug, Bulldog, Cavalier King Charles Spaniel, Boston Terriers, or Boxer among others is a potential candidate for the stenotic nares. These narrow nostrils are not restricted to dogs but occur in some cat breeds with flat faces such as Persians and Himalayan cats. This condition is congenital or present at birth and inherited. It will cause sniffling, sneezing, snoring, snorting, grunting and clear nasal discharge. The more the nares are pinched, the greater the likelihood of symptoms and breathing difficulties. In some dogs, the problem is so severe that the dog is forced to breathe through his mouth. Besides the loud breathing sounds, you might also notice that the dog cannot play for very long before having to take a break and rest. His gums may be pale or even blue if they are not getting enough oxygen into their lungs. In severe cases, the newborn puppy does not make it past the weaning phase. In older dogs, the snorting noise you hear may be cute, but may be one indication that the dog is having trouble moving air in and out. But you don’t have to wait to hear that snort. 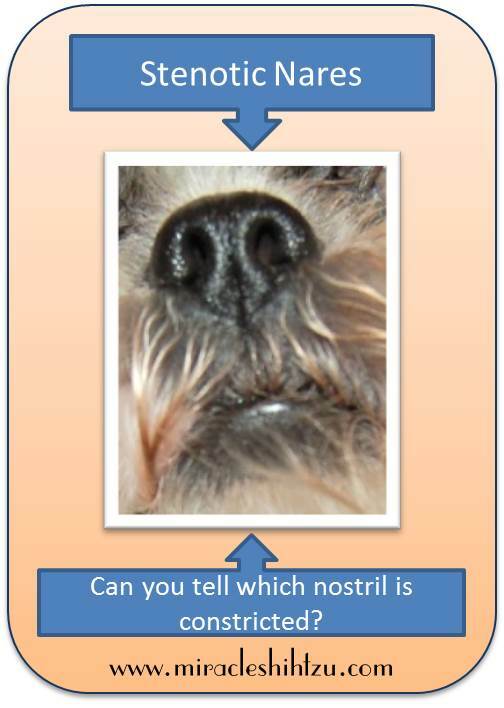 Stenotic Nares is easy to diagnosis simply by looking at a dog’s nose. Healthy noses will have well-formed openings. The determination is made by visually inspecting the openings and is likely to be something that your vet will recognize on the puppy’s first visit. If other problems associated with the brachycephalic syndrome are present, they are not as easily visualized. If the opening in the nostrils is tiny, the vet may suggest surgery to improve the airflow through the nostrils. The procedure involves removing a small wedge-shaped piece of the nose tissue. Many vets will recommend that this surgery is postponed until the dog is neutered or spayed at about the age of 6 months. If the opening is just slightly narrowed, other measures may be helpful. Sometimes anti-inflammatory medications, steroids or oxygen therapy may be required to relieve symptoms.